Review When flatscreen TVs first arrived, they were expensive and had picture quality considerably inferior to traditional CRT screens. But they meant that large screens were a possibility without taking up acres of real estate in the living room. And although picture quality wasn't so good, the TVs looked great with the picture off. Better, often. Now that image quality is so much improved, prices have come down and - oh yes - they don't make CRT TVs in any significant numbers any more, flatscreen makers have continued to make sure their tellis look good with no picture showing. So Samsung introduced its popular "Rose Black" styling, with a hint of red glowing through the gloss frame from certain angles and in strong light. 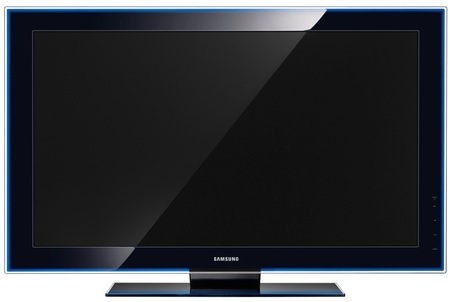 This model, part of Samsung's 7 series of LCDs, goes for a new hue, "Ocean Black", so it's blue that gleams at you. It's subtle but effective, only really leaping out on sunny days and disappearing pleasingly in dimmer rooms. This frame edge is the finishing touch on a stylish TV. The frame isn't as narrow as some of the latest models, but the clear plastic around the Ocean Black sets it off well. But of course you'll want to switch it on too, and there's a touch-sensitive button on the front of the frame to help you. Touch gently on the frame and the red standby light flicks into a column of blue lights and - just so you don't miss it - a little tune plays. Hmm. Once it's on, Samsung has crammed a lot of technology into this baby, including full 1080p HD, a 100Hz frame refresh rate and LED backlighting. But instead of one blanket covering of light from a strip bulb, this TV uses a number of LED arrays which are individually adjustable. 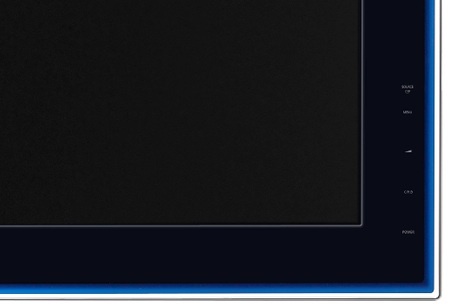 So when there are dark areas on screen, the TV turns off the relevant arrays to deliver deeper blacks and greater contrast levels than is possible with regular LCD.